This mod is under indefinite hiatus! This mod requires Forge! Then just drag this zip into the .minecraft/mods folder. Please leave a comment if we are no longer compatible with the latest version of forge, or if there are any bugs in the mod! Think about donating towards the development of this and any other projects I currently work on. All my mods and projects are completely self managed, and making sure they are as good as they can be is top priority! All donations are greatly appreciated! You may feel free to use this mod in a modpack, provided proper credit is given (i.e. Made by xFyreStorm), and you in no way claim to own this mod. Updated to v0.0.2, you are now notified of newer version, added reloading (although you still have infinite ammo), and an ammo hud when you're holding a weapon. Looks cool, downloading right now. here you go, hope you will like it :3 keep up the good work here too! Thanks! Already had psychos and bandits in the old version, I may just re-add it tomorrow. Thanks, I'll make a videos section! I re-added quite a bit this update, shield which go in your chestplate slot, are randomly generated, will block incoming damage, regen over time, and some even have elemental novas which are released upon depletion. Their capacity is shown over your hp as blue hearts. Marauders and Psychos spawned with meaningless levels at the moment, and Psychos have a small chance to spawn as midgets. Marauders have the same chance to drop weapon as all other mobs, but instead of a random weapon they'll drop the weapon they're holding. Weapons now take time to reload in seconds as shown in their stats. (May need some tweaking.) Enjoy, can't wait to here what you all think! wow I'm definetly doing an updated review after the mobs are improved! shields is a great part to implement, good job! I should check it out! will you add reloading sounds and ammo any time soon? Definitely gonna try and add sounds in the future, for shooting different weapons, reloading, and other small things that may need it. Thinking about it, I should put a to-do list in the original post. Another new update, and again, a bunch of new changes! Added a recipes section to the post to show the 3 new recipes, and I'll just post the changelog here as well. 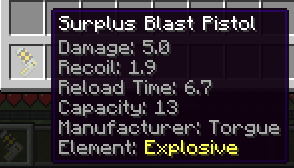 v0.0.4 (1/29/13): Ammo no longer infinite, unless in creative mode. Mobs have a chance to drop ammo for a random type of weapon on death, and a small chance to drop an eridium bar. Added eridium fragments, bars, and ore. Eridium Ore now gens in worlds. 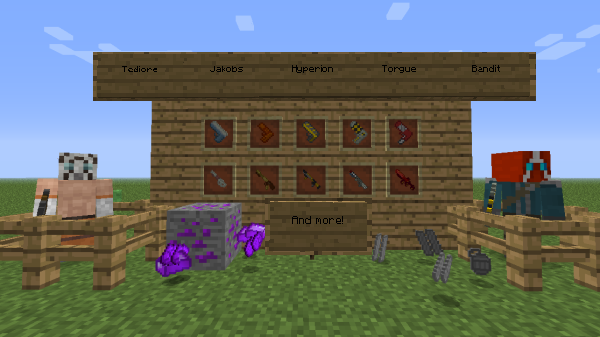 Villagers will sometimes have trades for weapons/shields using eridium. Added ECHO communicator which shows mob name and hp when looking at them when equipped (legs slot), still needs a little work though. Hope you like it! Hopefully I haven't forgotten anything. Seriously suggest you keep working on this, it's so cool! Is there a config file for this? I can't seem to find it. Also, is it compatible with other mob mods, like mo creatures. I see all mobs dropping ammo, but I can't find any of this mods mobs. No config file yet, but was planning on adding it in the next update for item ids and stuffs. It should be compatible with any other mod provided there are no conflicts with item and block ids, seeing as this mod edits absolutely no base files. And there are currently only two mobs, the Marauder and Psycho which you can find spawn eggs for in creative (blue and red at the moment), as well as they spawn during the night on easy or higher as most other hostile mobs. Ammo pickups seem odd. Sometimes it picks up, sometimes it doesn't. Unless I'm just confused and I'm not finding much pistol ammo and just a bunch of everything else. Killed around 100 mobs and only saw my ammo count go up a couple times until I was out of ammo. Edit: Probably just me being an idiot and not finding any pistol ammo drops. Also, reloading a save seems to refill my ammo in survival. I'll probably change it to make only pistol ammo drop for the moment since it's the only available weapon, but most likely the ones that wouldn't pick up were for other already full ammo types. And I'll look in to the full ammo on reloading, I didn't really do all that much testing with that. Updates will be coming, but I honestly haven't had much time to work on either of my mods the past few weeks, due to spending most of my time on a higher priority project. Definitely plan to take a day to work solely on this and my other mod, because I have some small stuff ready for both, it's just a matter of getting it done and adding a bit more. Take your time! As-is this is a really great mod. Being able to wield special/randomly generated shields and weapons is exciting. Just finished updating my main mod to 1.5, so now I'm going to start updating this one. My main mod took a couple of days to figure everything out with the new texture system, and although I've figured that all out now, I'm not sure it'll be any quicker for this mod, especially with the fact I'm also going to try and throw in a couple of new things, but, as soon as that's all done, I'll put up the new links. I'm definitely going to try to step it up again with the updates after I finish updating to 1.5, the least I can do is finish up some of the main features, like other weapon types. I really do want to see this mod through, so I'll definitely try to make more time to work on it. It's not going to be a FULL Borderlands mod, but I definitely want it to be supplemental to the Borderlands mods that are already out there. EDIT: Updated to 1.5. Only some small changes for the moment, but everything should be up and working, if there are any problems, be sure to leave them here.